Bamboo, a versatile eco-friendly material, has been traditionally used in construction since age-old times which has now found prominence within the home interiors of our home. The versatility that bamboo offers allows it to be incorporated and adorned in many ways ranging from simple furnishing, be it mats or window screens to solid furniture, feature wall and flooring finishes. With many benefits, bamboo, when locally available, is a feasible product owing to its renewability and density compared to normal timber. Its’ flexibility, hardness and easy workability, makes it an excellent choice for home décor with warm and natural colour tones. With timber being a limited and expensive commodity, bamboo could be the future décor material with its excellent durability and strength. Not convinced yet? 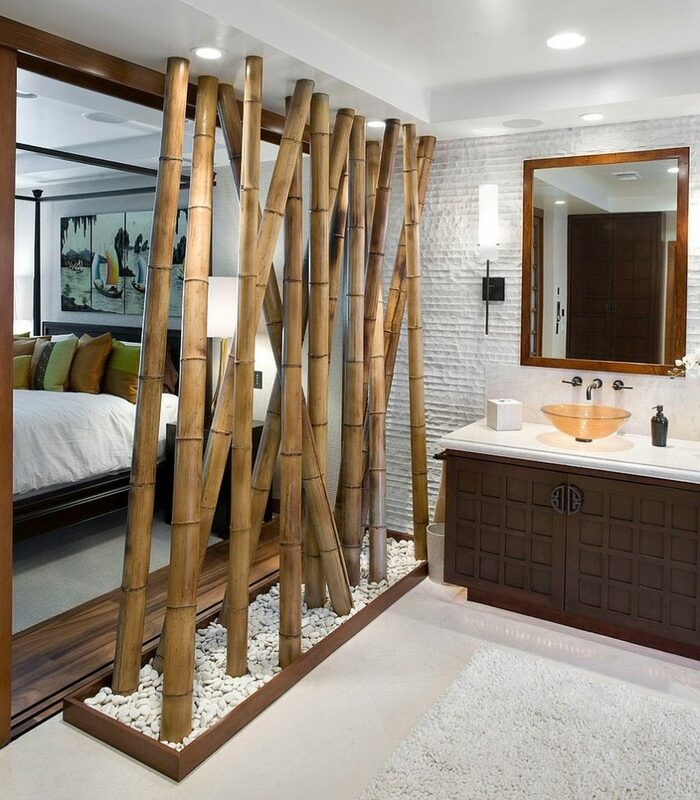 Read on to find out 8 great ways Bamboo can be used to decorate the interiors of your home. 1. Bamboo flooring provides a neat finish and, in a room with fewer furnishings or lack of other adornments, it suffices with its texture and rich colour tone. 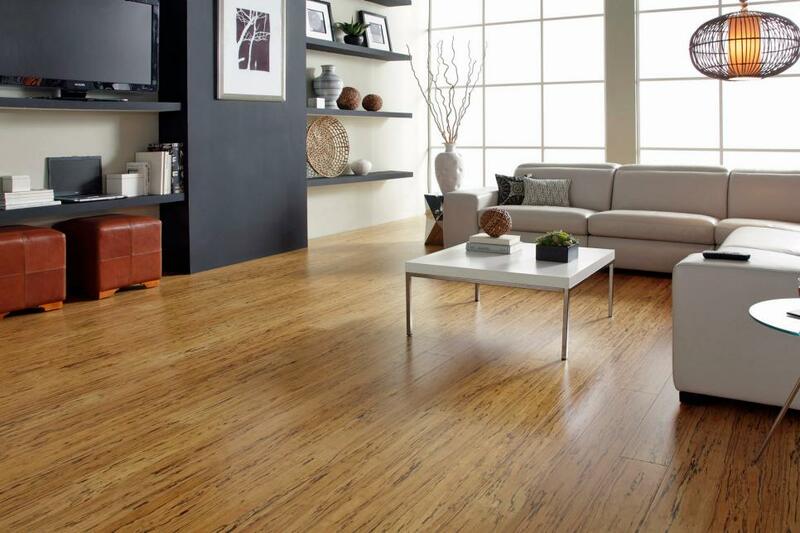 Being comparatively less expensive than hardwood flooring, it also benefits from its easy to clean nature. 2. Bamboo canes can be placed artistically or suspended from the ceiling in an interesting configuration to make way for an exquisite feature or partition In certain cases, one can opt for faux finishes too in places of unavailability. They tend to exude an elevated sense of warmth and elegance to the living space or room. The translucent nature of the wall aids in creating a spacious feel to the environment it encompasses. 3. Bamboo Fence made out in the backyard out a compact and tropical look. You can use wood to frame the bamboo for a finished look. 4. 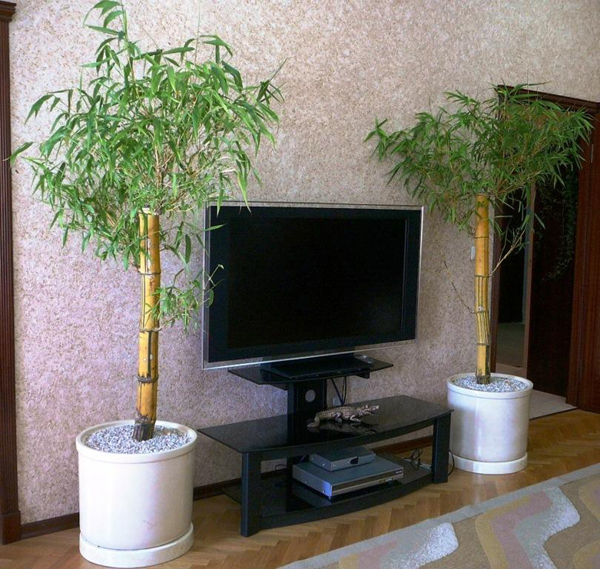 Bamboo plants tend to build a serene and tranquil environment with their freshness and reflect the ideals of Zen garden. Arranged in pots or vases, they emanate peace and sense of cosiness to the place they adorn. Another way to avail the benefits of this wonder material could be by integrating our homes with a small garden that require minimal maintenance. 5. Bamboo cane furniture is one of the most well-known uses of bamboo that have grown multifold in popularity owing to their rustic ambience. From living room furniture to outdoor seating, bamboo is even incorporated for kitchen cabinets and bedroom furnishings, both in the individual canes to woven form. 6. Shading– Bamboo pergolas are commonly used for outdoor shading. 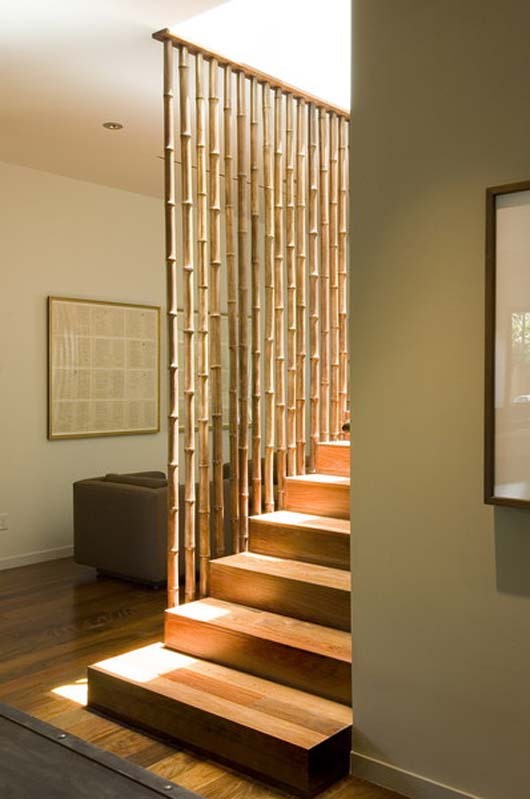 Woven bamboo shades are being used nowadays that provide for a pleasant ambience and an enthralling sight with its clever interplay of light. Available in various colour tones, these shades are portable and can be easily taken off when not in use. 7. Bamboo can be used in restrooms to create for a classic and yet contemporary feel with its vivid texture and natural colour. Used as a backsplash or as adornments around bathtub or sink, bamboo promotes a soft vibe amidst the strong outline of faucets and ceramic tubs etc. 8. 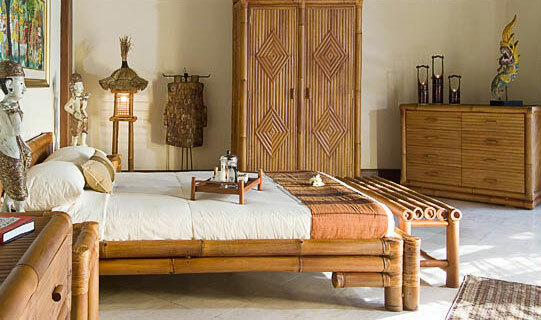 In bedrooms, apart from the elegant blinds, you can opt for bamboo beds that incorporate exhilarating handwork with bamboo crafted from sustainable farming practices. If acquiring such a bed is much of a hassle, you can bring the intricate feel of it by opting for memorable headboards or by creating a wall décor out of bamboo. Ranging from an extravagant living room partition walls or other wall embellishments and flooring to LED lighted lamps and simple furniture, bamboo can be cleverly crafted into various configurations with a little creativity.